I’ve started tinkering with Bitcoin Mining. Power usage is the single largest cost, so you need ensure that you are using the absolute least expensive power in order to generate as much profit as possible. I live in Georgia and subscribe to Georgia Power’s ‘Smart Usage’ program, which has lower costs most of the time, but peak periods which are Mondays-Fridays in June-September between 2pm and 7pm have a much higher power cost. My full calculation puts the non-peak price per kWh at about $0.048 and peak prices at about three times higher at $0.151 per kWh. Mining bitcoin on an Antminer S9 is mildly profitable at the non-peak price, but definitely loses money at the peak price. Since it runs on a 220v plug, I can’t use something off-the-shelf like a smart plug to turn it on and off. I’m a linux geek anyway and would rather do it with software. The Antminer has a very bare-bones Linux OS, but it fortunately has crond installed, even though it is not running. These steps will enable crond and create a cron job that kills the bmminer process during the peak hours. It then reboots when the peak period is ending and starts everything back up. Note that the machine is still on with fans running. It just doesn’t run the mining process which consumes all of the power. 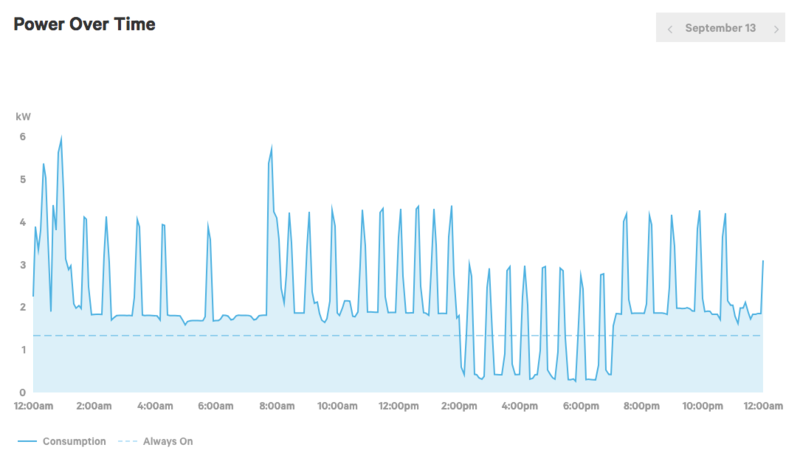 You can see my power usage in the chart below, showing that power usage dropped significantly during the time from 2pm-7pm. Finally, just type reboot at the command line to have the machine restart. This is very helpful, thanks for sharing.